16 new highs and up 18.19% in the last month. 49.53% gain in the last year. 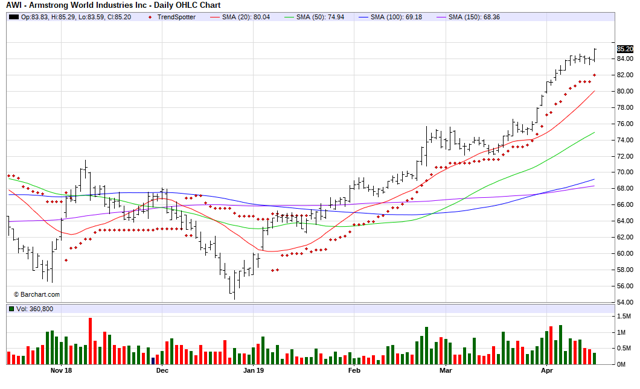 The Barchart Chart of the Day belongs to the building products company Armstrong World Industries (AWI). I found the stock by sorting Barchart's All Time High list first by the most frequent number of new highs in the last month, then used the Flipchart feature to review the charts for consistent price appreciation. Since the Trend Spotter signaled a buy on 1/18 the stock gained 31.69%. Armstrong World Industries is a global leader in the design and manufacture of floors, ceilings and cabinets. Armstrong's consolidated net sales totaled approximately $3.5 billion. Based in Lancaster,Armstrong operates Forty plants in ten countries.